Home Adaptations Physiological Adaptations How Far Can a Polar Bear Smell? Polar bears have probably the best sense of smell throughout the entire animal kingdom. Dogs can detect any object hidden 40 feet underground if they stand right at the top. 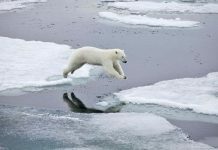 Polar bears, on the other hand, are able to smell seals 3 feet underneath the ice even if they stand at about 5,249 feet from the source. That is why they rely more on their smelling sense than on hearing or sight. 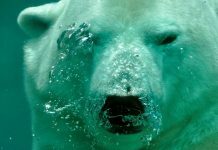 The polar bears hearing sense is nearly equal to that of a normal human. 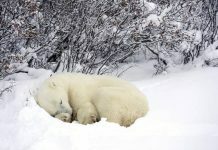 Polar bears use their keen sense of smell not only to find seals but also to pick out the smell of their counterparts. 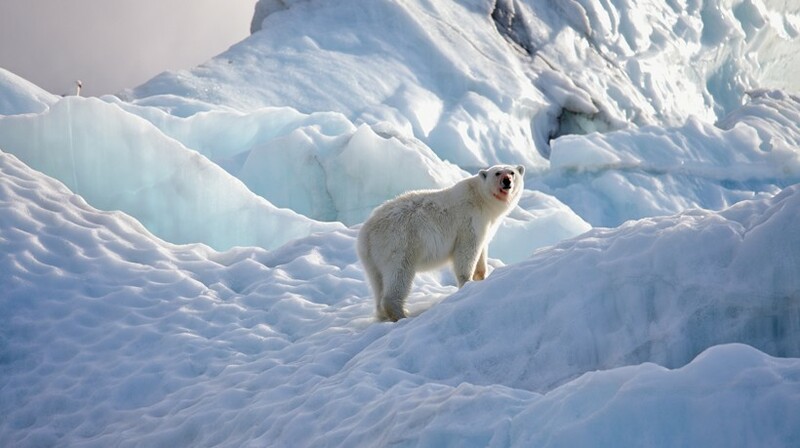 While navigating through the arctic habitats, white bears will sniff on each step. This shows how much alert the bears are not only to the prey but also to any possible threat. This is quite handy during mating season when male bears must find females. Yes they probably do! 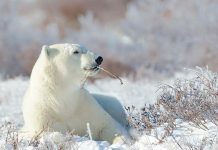 Thanks to their remarkable sense of smell polar bears can afford to wait thousands of feet from the prey—letting herself to go unnoticed. The most popular hunting method is still hunting in which the bear crouches with light steps while approaching the seal breathing hole. She can wait for hours in order to allow the seal to swim near the surface. When the seal exhales the polar bear smells it and reaches for the kill. 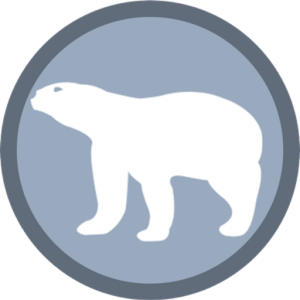 Read More: How Do Polar Bears Hunt Seals? The study of polar bear’s skull shows that the foramen (the opening or passage in the bone) is linked with 12 cranial nerves. The cribriform plate (a sieve-like structure between the anterior cranial fossa and the nasal cavity) supports the olfactory nerves. This is quite common in all animals which have acute smelling sense. The cranial nerve typically finds its way via optic foramen and punctures the orbitosphenoid bone. The orbital bone lies at the anterior lacerate foramen. The foramen rotundum together with the foramen ovale are thought to puncture alisphenoid bone. Scientists have recently come up with the discovery of another cranial nerve which lies at the olfactory nerve. These nerves assist the bear to locate prey which may be a mile away. While polar bears do not normally eat humans they do however attack if they find one on their way. The olfactory signals help the bear to detect the human sweat. Sometimes it so happens that a hungry polar bear is navigating through the arctic and suddenly she finds hikers or photographers who have set a camp. All of a sudden she finds you as a prey. Furthermore the smell of a carcass can bring the bear near you so beware not to set up a camp near carcass.